Ok since we have 16 members we will start a tourney. The main parts are that the duels will a match 2/3 duels and if after 2 days, If 16 members didn't sign up we will start without the rest. All decks are allowed except loop , burn , meta and stall.no six sams >.> and no chaos dragons. The decks cant be changed so that means that you will play with the same deck for the whole of the tourney. The matches wont be with September ban list so bri and tour and those cards are allowed to be used. Yays! A tournament. <3 I am joining this. all you do is signup on the page. btw nearly one day has pased so you have just over 2 days to sign up before we start! nearly 2 days passed so just over 1 day left guys 7 people have joined so far! 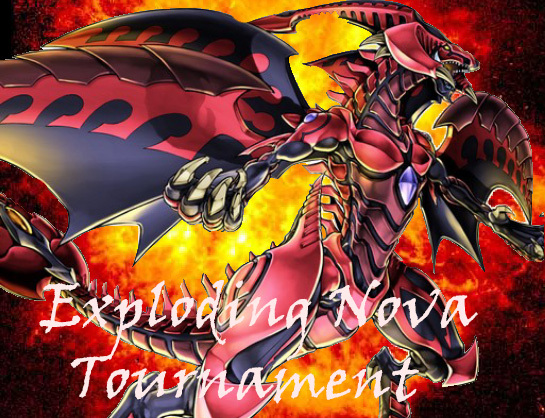 ok we have 12 member and 3 days have passed so now i will start Nova Masters First Tournament!